I’ve also learned that people get mad when you insult their cars. For instance: you write one little column about the Hummer H2, and suddenly you have a bunch of angry people stopping the tattoo artist mid-ink so they can send you a nasty e-mail. This surprised me, considering that I insult my own vehicles in my columns more than anything else, and I never get angry. But most importantly, I’ve learned that we love the Mazda Miata. Am I right, Jalopnik? No feeling in the world is quite the same as opening the door of a first-gen Miata, sliding over four pounds of worn foam on the tattered driver’s seat, reaching for the stereo, realizing that the stereo doesn’t work, and then going for a nice, spirited drive through the country, wind in your hair, all the while thinking: If I get hit by an SUV, they’ll have to use dental record to identify my body. It’s really the perfect car, which is proven when you ask a Jalopnik reader for car advice. Really: ask any one of us what car to buy, and the answer will almost invariably be the Mazda Miata. This is true even if your question is something like: Can anyone recommend a car for my 87-year-old grandfather who recently fell and broke his hip? A true Jalopnik reader would reply to this by saying: Get him a Miata! His hip will be healed by the top down fun! And the occasional bursts of climate control! They will also insist that he gets a manual. 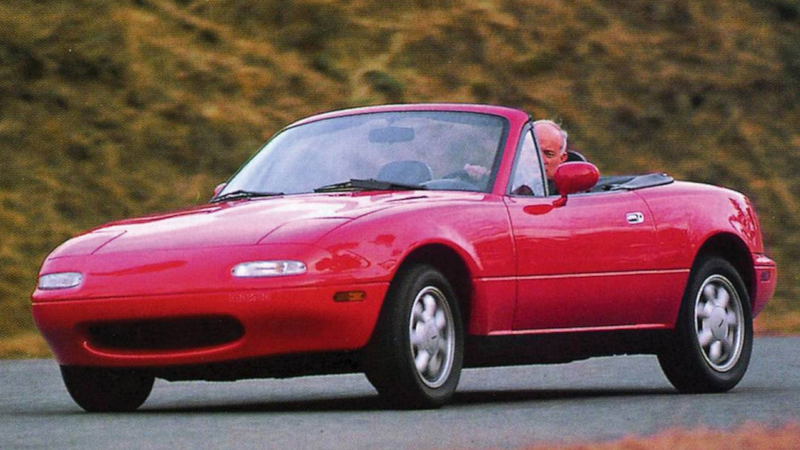 Yes, Jalopnik readers love the Miata, and with good reason. It’s reliable. It’s fun. It’s easy to tune. And you can find one on Craigslist all day long for roughly the price of a used armchair. There’s only one problem: people think it’s a girl’s car. Now, I want to say right off the bat that I have no qualms about driving a girl’s car. When I was in college, I had a 2001 Audi A4 finished in a color Audi charitably called “Hibiscus Red Pearl,” even though it was actually a deep shade of purple. This was a major girl’s car, a fact I verified every time some guy in a lawn care truck would pull up next to me and stare inside, hoping to see some hot sorority girl coming home from the gym. Instead, he got me, which taught him a crucial lesson: if you want to ogle women in cars, stick to the Volkswagen Jetta. But some enthusiasts don’t like the idea of driving a girl’s car. Some enthusiasts want their cars to be manly, and tough, so they buy a pickup and jack it up off the ground, way up, so high that women can’t even get inside of it, because nothing says “manly” like cruising around the Wal-Mart parking lot on a Friday night with four of your best bros. Anyway: this is the problem we have with the Miata, right? It’s a small, 4-cylinder convertible. It has soft, rounded lines. It’s Japanese. It’s not especially loud, or fast, or daring. It’s a girl’s car. I think the Miata attained the “girl’s car” reputation back when it first came out, because women saw it as a “cute new thing” and started buying it in huge numbers. This is the same reaction old people had to the Chrysler PT Cruiser. But years later, it’s no longer the cute new thing. Sales are down to a trickle, and I believe the only people buying it – new or used – are those who appreciate its performance. Unfortunately, it’s a bad idea to write a column based solely on a belief, without any hard evidence to back it up, although this rarely seems to stop the Huffington Post editorial staff. So I recently took to the streets and spent the last few weeks observing Miata owners in their natural habitat: a cramped driver’s seat, wearing a coat, and shivering because there’s a hole in the roof. This is what I learned. 1. People who own first-generation Miatas are all young men who are either currently driving to an autocross, currently at an autocross, currently coming back from an autocross, or currently stoned. 2. People who own third-generation Miatas are all slightly older men who know the first-generation is more fun, but want creature comforts, such as working headlights. Eventually, they will give up trying to convince people it isn’t a girl’s car and lease a 328i. 3. People who own second-generation Miatas are simply confused. 4. People get really freaked out when you stare at them as they drive their cars, unless of course you are a lawn care guy, in which case it’s just accepted as normal behavior. The overall message here is that women aren’t really driving Miatas anymore. It’s a man’s car now. So if the girl’s car stereotype has stopped you before, head on down to a dealer and take a look at the Miata. And bring your 87-year-old grandfather. It’s the perfect car for him, too.